When it comes to increasing the value of your home, changing the mood or creating a more inviting appearance FROM THE STREET should be your first go-to DIY project. 1.) DEBRIS: Make sure your yard, driveway and porch are free of any debris. Having loose trash, rubbish or clutter can say a lot about who lives in the home and can be very unappealing to anyone wanting to purchase your home and/or purchase in your neighborhood. 2.) FRONT DOOR: Three simple things you can change is the style, color and accents of your front door. Choosing a style that best matches the architecture of your house, but stands out, can go a long way. Painting the door a color that pops can set a cheery mood for anyone when viewing your home. Trying unique, yet fun, door knob plates can also set the tone for your entire house. Whether you have a sleek mid-century or a classy craftsman, there are plates for all types of front doors. 3.) HOUSE NUMBERS: Not only are house numbers a useful tool to allow friends, family and potential buyers to navigate, it too can set the tone for your entire house. Choose something that mimics the style of your home, go big and go bold! Not only is it a great, easy and inexpensive change, it can also be a fun project with so many great options! 4.) LIGHTING: Changing your older porch light fixtures with something more contemporary or LARGER can make a big difference on your hoME'S curb appeal. Add solar lights up your walkway or stop by Home Depot and purchase landscaping spot lights, this will bring life to your home around the clock. 5.) ROOF & GUTTERS: Having debris hanging from your gutters and moss growing on your roof may not seem substantial, but can MAKE YOUR HOME SEEM NEGLECTED AND LESS desirABLE. Have your roof treated for moss once a year and clear your gutters. Doing these things can not only make your home LOOK NICE, it can also extend the life of your roof and PREVENT water from entering your crawl space or basement. Four weeks in and January is almost over. The following weeks we've been focusing in different areas of Portland, but this week we'll be all over Portland. This weeks five homes under $500,000 will be all condos. You may have stayed in a condo with a friend or the now popular AirBnB, but this week you'll be looking at ones you can own. Whether you're downsizing, looking for life in the heart of the city or just a simple rental investment, look no further, because this weeks five homes under $500K is where you'll start. Built in 2007, this townhouse has a lot of space for it's dollar. Found at the end of a quiet cul-de-sac, two-stories and brand-new wood laminate floors the space isn't the only thing this place has to offer. Priced just under $250K, it includes a kitchen with an island and beautifully cherry stained maple cabinets. If you like to live outside of the city, but just close enough then this Milwaukie townhouse is just right for you! Coser in to the city you can find this beautiful Belmont Street Loft. South facing, wood beamed high ceilings and concrete floors make this condo feel industrial but also comfortable. Not only is it very close to Stumptown and Zupans, it's also down the street from many other shops and restaurants. This condo is sure to be a walker/bikers dream and will go fast. Just finished, this brand-new condo is top of the line. Located in the popular Richmond neighborhood but still close to downtown with a bike score of 97. Brand-new quartz countertops, stainless steel appliances and brand-new tiled bathroom floors. If you prefer everything you buy to be brand-new, then you better get in line for this brand-new Richmond condo. As we step even closer to downtown Portland, you'll find this cute condo on the river in the Riverscape development. Close to the popular and fast growing Pearl District neighborhood and a great place to live if you like to walk. Who wouldn't like to wake up every morning and step outside to walk along the Willamette River? Hardwood floors throughout and priced just under $350K, this is another condo that will be off the market fast. Last, but not least is our very own Selling PDX team's listing in the heart of the Pearl. Priced just right you can't go wrong with how much space you can get in this condo. This beautiful Pearl Lofts Condominium has soaring 12ft ceilings and gorgeous oak floors. The front door opens up to a beautifully maintained secured courtyard and exits right into downtown Portland, a city dwellers dream. Feel free to stop by this Sunday, January 31st, from 1PM-3PM to walkthrough our open house. If you have any questions about the homes we've shown or real estate in general, feel free to contact myself or anyone on the team. We would love to help! Three weeks into the year and and the demand for homes is at it's all time high. Not to worry, we still found your five homes under $500,000. Last week we focused on the Northern quadrants of Portland. This week, you guessed it, we'll be focusing on the Southern quadrants of Portland. Southeast spans from the warehouses along the Willamette through the historic Ladds Addition to the Hawthorne and Belmont districts. You can also find Portland's very own cider cone volcano, Mt. Tabor and the popular Peacock Lane, which is the street best known for their festive, over the top, holiday decorations. On the other side of the river is Southwest, beginning downtown with Pioneer Courthouse Square and Portland State University which has the largest student body in the state of Oregon. Southwest is loaded with scenic hikes through the hills around OHSU, beautiful parks and our very own Oregon Zoo. With all of these great things you can still find a house under $500,000 and here they are. Built in 2008 this custom craftsman has surprises around every corner. Everything from the cabinets to the attached drive-thru garage. Close to the popular Multnomah Village and walking distance to many shops and restaurants. Loaded with 1,924 square feet you can find surround sound wired in, a laundry chute and bonus storage. These are just a few of the unique finishes the builder chose for this home. Priced just under $490K, this home is something you just can't miss. Recently updated, this 1949 day ranch can be found close to the desirable Hayhurst neighborhood. This home is prefect, especially for your buyers who are looking for the master suite on the main floor. Sure to last with it's brand-new roof, new fence and new paint. Not to be alarmed by the missing range and dishwasher, because this seller is giving a credit towards just that. This spacious home is ready to sell and move-in ready, get this one while it's lasts. Custom built with stylish mid-century architecture is this beautiful home found in SW Portland. Close to Woods Memorial Natural area where you can find trails and hiking. This home has a vaulted open beam floor plan and is located on nearly half an acre in the Ash Creek neighborhood. This home includes a second living room, a fourth bedroom and its very own kitchenette. All of these things can be found on the lower level with makes this home great for entertaining guests. If being energy efficient is your thing, then look no further than this brand-new two-story craftsman. This home is Earth Advantage Platinum Certified which makes this home energy efficient, which we all know saves dollars and helps our environment. This home is located in the popular Foster-Powell neighborhood which is rich with diversity and has been affectionately dubbed as FoPo. The generous floor plan offers 2,099 square feet, box-beam ceilings and stainless steal appliances. Walk score 80 and bike score 79 makes this home a walker/bikers dream. Just renovated from top to bottom is this gorgeous craftsman that was taken down to the studs. If you like the idea of new things then this is your calling, new 95+ furnace, new A/C, new roof and new new new. Built in 1908 this home has managed to be completely redone and still keep it's early 1900's charm. Bamboo floors throughout and new sound proofing make this home a must have. Priced just under $500K and offering a generous 2,542 square feet makes this home ready for new owners. The new year has begun, the rain is still falling and the market is still moving ever so fast. This week's five homes under $500,000 will be focused in the Northern half of Portland. North and Northeast Portland contain some of Portland's most expensive and oldest neighborhoods like Irvington and Alameda, but North Portland also contains our Portland International Raceway, the University of Portland and massive cargo facilities of the Port of Portland. Throughout North and Northeast you can find some of Portland's best city parks and one of the Portland's most photographed bridges, St Johns. Though this part of Portland sounds expensive, there are still homes under $500,000 that won't last long. Built in 2013 this two-story traditional home is located in the heart of NoPo. Wood floors throughout, stainless steel appliances and a large master suite with a double closet. Walking distance from Columbia Park and close to the future New Seasons. With this home being so close the University of Portland this home could easily be rented. Priced at $325K this 1,699 square foot home is priced priced right and ready to sell. If you're looking for more bang for your buck then look no further. Priced just under $400K this five bedroom two and a half bathroom 1924 remodeled bungalow offers plenty of space for it's next owner. The beautiful bungalow comes with a remodeled kitchen with white shaker cabinets, granite countertops, stainless steel appliances and slate floors throughout your living room and dining room. Close to University Park and close to eating and shopping. Just built and never lived in, this Royal Custom Homes construction in definitely a home you have to see. This craftsman is considered attached, but there is no common wall. The builder paid specific attention to the sound insulation between each townhouse, making it very quiet for each owner. Only one block away from Northgate Park this new construction has a great open floor plan. Equipped with custom cabinets, quartz countertops, designer light fixtures and beautiful Birch floors. Most condo or townhouse style homes have a monthly HOA fee, but this one does not. Contracted by a reputable builder, whats not to love? 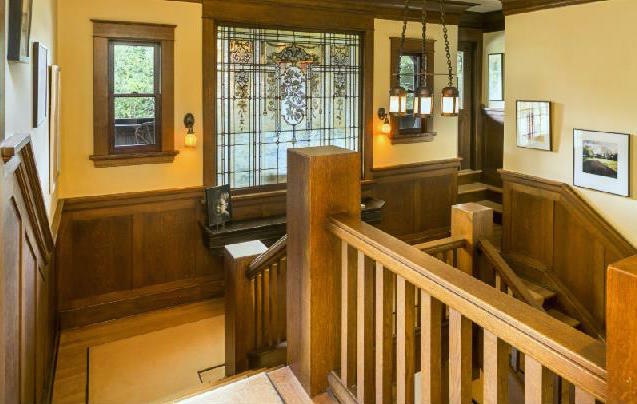 Built in 1910, this beautiful craftsman has more to it than meets the eye. New windows, hardwood floors throughout and a fully finished basement are just a few things this home has to offer. This craftsman has a generous fenced backyard that would make any gardeners dream a reality. Close to Rosecity Golf Course and Beaumont/Alameda shops, restaurants and great parks. Priced at $450,000 and offering 2,739 square feet will make this home fly off the market quick. Last, but not least we have this tastefully remodeled english cottage found in the Rose City neighborhood. Offering newer roof, gas furnace, water heater and central A/C makes this home a must have. Built originally in 1927 this remodeled home has managed to keep its 1920's charm. Homes like these don't last long. If this is something that suites your needs, in this market, you have to act fast. With the holiday hustle finished and the snow melted lets start the year off right with five more listings under $500,000. This weeks five homes under $500K will take you all over Portland and will show you Portland's most competitive price point. The array of homes this week range from a capecod, a cottage and a cute condo in the heart of SE Portland. 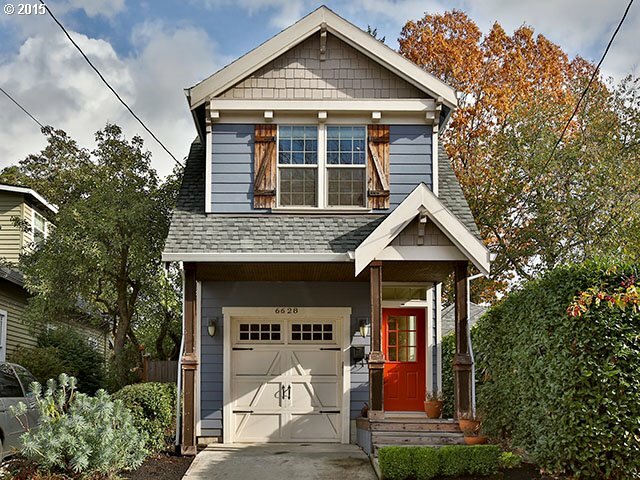 This cute 1953 remodeled one-story can be found in the popular SE Foster & Powell neighborhood. This floor plan includes four bedrooms , two bathrooms and an attached garage. Listed at $339,900 this home comes equipped with new kitchen cabinets, counter tops, tiled backsplash and stainless steal appliances. Newly finished hardwood floors makes this home move-in ready! Tucked in the Richmond neighborhood this remodeled 1920's bungalow has managed to keep it's character and provide an abundance of space. Coming in at 1,942 square feet and having a walk score of 85 this three bedroom two bathroom home is definitely a crowd pleaser. Listed at $475,000 this one is sure to go fast! Just listed at $479,000 this 1940's recently remodeled capecod has three levels with a total of 2,304 spacious square feet. You can find this four bedroom home in the Arbor Lodge neighborhood. Conveniently located close to New Seasons, Fred Meyers and Max Line this home is a walkers dream. You can't go wrong when it offers new windows, refinished floors and a newer roof. Now if homes aren't your thing and you prefer something a little more low maintenance, look no further than this 2004 contemporary townhouse. Located in the highly sought after Hawthorne Neighborhood this townhouse is listed at $479,000. Light-filled, two bedrooms and two and a half bathrooms this 1,459 square foot townhouse is bigger than most. Conveniently placed across the street from Fred Meyers and having a bike/walk score of 95 this is one you just can't miss. Last but not least is this beautifully remodeled 1938 cottage is just minutes away from West Sylvan Middle School and Park. Gorgeous hardwood floors throughout and offering newly updated kitchen and bathrooms. This home has plenty of room for guests and family especially with the fully finished basement. Don't miss out on this great house in a great location! As the leaves and rain continue to fall, so does the inventory of homes for sale! Low inventory continues to fuel a competitive market with many buyers still on the hunt for the perfect house. This week's five homes under $500,000 include a mix of condos, remodeled ranch homes and new construction. Depending on your needs, a budget of $500k can get you a high-rise loft in the middle of it all or a modern new home just outside of the city center. Nestled in the highly sought after Pearl District Neighborhood you can find this contemporary condo. Priced at $320K, fully equipped with gas appliances and beautiful hardwood floors, the floor to ceiling windows make this 847 square foot condo feel bright and open. With a large terrace and a beautiful view of the West Hills, this condo is ready to sell. This fully remodeled 1950's ranch can be found in the beautiful city of West Linn. New appliances, roof, gutters, fixtures and carpet make this home move-in ready. If you want a home in like-new condition just outside of Portland in a smaller town setting, then this is definitely a place you'll want to consider! Just five minutes from Portland's most photographed bridge, St. Johns, this ranch can be found in the heart of the Portsmouth Neighborhood. Built in the 1960's, this newly remodeled home has 2,556 square feet of new carpet and hardwood floors. A convenient location near University of Portland and the soon to be finished New Seasons, this home is ready for the holidays. Recently finished new construction, this home is ready to wow. With brand-new Bosch appliances, hardwood floors and a spacious floor plan this home is truly move-in ready. Stunning details and designs with a modern touch in NE Portland. Recently completed, this is another example how modern homes are the must have of 2015. Fully equipped with a one year builder warranty, electric range and dishwasher. Just minutes from Reed College and Woodstock Park, this Mt. Scott modern is in an up & coming area of SE Portland. As part of a new series on our blog, each week we will highlight some of the best new listings under $500K. This price range has been one of the most competitive for our buyers. Many homes have multiple offers in just a few days and lines out the door for showings. Below you'll find our picks for this week's five homes that are priced under $500,000 in Portland. As I write, this home just went pending in less than 48 hours. This modern "craftsman" style townhouse can be found nestled in the Piedmont neighborhood. Priced at 370K, it comes equipped with stainless steel appliances, customs tiled baths, an attached garage and ample amounts of space. Originally listed much higher, this home's new price is just $399K! This remodeled bungalow can be found in the Portland Heights neighborhood. Just a short walking distance from Marquam Nature Trail and Council Crest Park, it is also only minutes to downtown Portland and the Oregon Zoo. This updated brick bungalow in SE Portland's Woodstock neighborhood is priced at $425,100. It is close to great schools and many shops and restaurants, including a brand new New Seasons! Located in the heart of Hawthorne, this early 1900's bungalow has a lot to offer. Original hardwoods and an unfinished basement makes this opportunistic home irresistible. On the market for a second time, no fault of the home, may be your calling. Last, but not least, this Kenton classic has managed to maintain much of its charm. Keeping it's original fir floors and clawfoot tub, this 1910 Victorian has all the appeal of it's time period while still being versatile enough to make this your own modern day home. Just blocks from Columbia Park and walking distance from great restaurants, you can't go wrong with this last house under $500K. If you have any questions about the homes we've shown or real estate in general, feel free to contact myself or anyone on the team and we we would love to help!